Two years ago this week, I was conducting research for my book at the FDR Library. Well, that’s not entirely true. I was in Hyde Park, New York and I was using the library’s resources, but both the library and the museum were undergoing renovations. The library was off-limits to visitors, but the library staff set up a cozy room in the visitor’s center for researchers to view the library’s archives. Every morning the other patrons and I arrived early to request the boxes of materials we needed, and one of the archivist’s assistants brought them in on carts. Sometimes I wish I had the chance to see the actual library, but that didn’t bother me at the time. I was too focused on reading documents from the War Refugee Board files and taking pictures of them with my digital camera (photocopying was not allowed because some of the documents were fragile). I also remember thinking that the presidential library might be large and intimidating. Frankly, doing research for my first book was intimidating enough, so I was content with the smaller room. 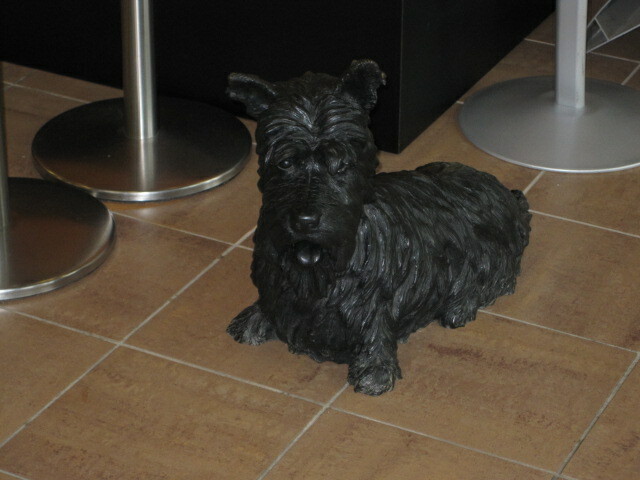 The visitor’s center also had a statue of FDR’s dog, Fala, near the entrance. I love dogs and missed my beagle mix who stayed with my mother in Illinois. The staff at the center may have thought I was a little odd when I said, “good morning, Fala” and “see you tomorrow, Fala” every day, but then they were probably used to eccentric researchers. The best part of the library/visitor’s center was Virginia, the archivist. The library had a great online finding aid, so I knew which documents I needed and the boxes they were located in. Unfortunately, there were two documents that I had only seen cited in other history books, and I had no idea how to locate them. Virginia didn’t, either because the filing system was changed after those books were written, making the citations almost worthless. Fortunately for me and my book, Virginia was determined to find what I needed. She seemed to take it personally when she couldn’t find a document. I thought, this woman is a researcher’s dream come true. I still can’t figure out how she located those documents, but she managed it somehow and I went back to Illinois with all the sources I needed. Some day I want to return to Hyde Park as a tourist, but I enjoyed almost every minute that I spent researching my book.